Diabetes is caused by high levels of glucose in the blood. Diabetes is a disease that affects millions of people around the world. It can affect anybody of any background or age. It is a type of chronic disease which means that once a person is diagnosed with it they will have to learn to manage it and live with it as there is no cure for diabetes. It is estimated that there are more than 382 million people worldwide living with diabetes, and that number is only expected to increase. According to the International Diabetes Foundation, by 2035 diabetes will affect approximately 592 million people. But what cause diabetes? Diabetes occurs when there are high blood sugar levels over a long period of time. There are two ways that glucose is introduced into the body: through ingesting food and as a secretion from the liver. It is the body’s job to allow cells to absorb the glucose from the bloodstream, which acts as a power source for the cells. The cells are able to absorb the glucose via the help of a hormone called insulin. Insulin is secreted into the blood by the pancreas. There are three main types of diabetes: type 1, type 2 and gestational diabetes. Type 1 Diabetes is the type of diabetes that one is born with, which is why it is also called “juvenile diabetes” as it is most commonly diagnosed in children. This type of diabetes occurs when the pancreas is unable to create insulin, hence not being able to allow the glucose in the body to be used up by the cells. The glucose then just continues to build up in the blood, which may lead to glucose toxicity. The reason the pancreas stops producing insulin is not known, but is believed to be caused by an auto-immune disease which causes the immune system to attack the insulin-producing beta cells in the pancreas. This auto-immune reaction is believed to be caused by a genetic condition, infection, toxin, or by environmental factors. Type 2 diabetes is when the body has gotten resistant to insulin and hence the insulin is not effective anymore. The pancreas is unable to make enough insulin to overcome this resistance. This type of diabetes can be developed at any age. The reasons for this type of diabetes are mainly diet, genetic susceptibility and environmental factors. 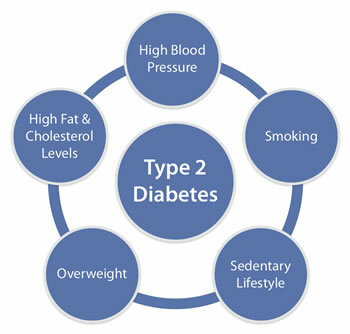 Being overweight, smoking, and living a sedentary lifestyle increases the risk of developing type 2 diabetes. Furthermore, a person is more likely to develop type 2 diabetes if he has a history of the disease in his family. Gestational diabetes only occurs in pregnant women. During pregnancy, the placenta produces hormones to sustain the pregnancy. These hormones make the cells more resistant to insulin. Normally, the pancreas increases the production of insulin to overcome this resistance, however it is unable to do so, and it leads to gestational diabetes. Having a family history of gestational diabetes, being overweight, suffering from polycystic ovary syndrome, and/or having a baby weighing over 9lbs (4kgs) increases the risk for gestational diabetes. A woman who develops gestational diabetes is at high risk to develop type 2 diabetes after the pregnancy.